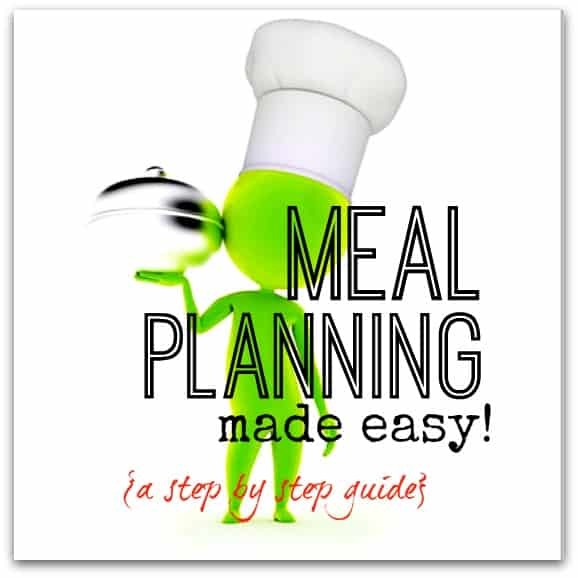 Meal planning can alleviate at least one stress in the day – and this step by step guide helps to show you exactly how to meal plan successfully – whatever your situation. Why bother meal planning at all? I wrote a post about the benefits of meal planning recently which goes into much more detail about why meal planning works so well which, if you are in any doubt about why you should meal plan at all is definitely worth a read. And for a quick reminder, let me ask a question – how many times have you heard one or all of these said in your home in the past week? Having to think about each meal each day can be time consuming, stressful, and often adds to the time it takes to get food on the table – so meal planning just makes sense. A little planning never did anyone any harm! Every home, every family and every situation is different, so I always recommend doing your meal planning so that it works best for you and your family. As always though, there are specific steps that you can follow however you want to meal plan, and I am going to take you through them now one step at a time – as always, following my ADORE method. So, lets get started, shall we! Step #1 – What do you do now? Always start by asking yourself what you currently do, how it works, what’s working and what’s not – that way you will be able to create or tweak your meal plan much more easily in the following steps. Take a couple of minutes to look at what you do now and keep this in mind going forward. Some families only need to plan out their evening meal, while others prefer to have breakfast, lunch, dinner and snacks in their plan – so first off it’s important to know what meals you will be planning. Understanding what all your families schedules are will help you to formulate a meal plan much more easily. Gather together any timetables or schedules you have already written, or simply note down the schedules of each person on a blank sheet of paper for now. What you are aiming for is to simply know who is in the house, and when. Who needs feeding each day? What time is there available to prep and cook the food? When can the food shopping be done? Who will do the prep / cooking / shopping? Now you need to know what meals you are going to cook in each slot you have – so the first thing to do is to write a list of all the meals that you cook currently. Alongside each meal, also write down roughly how long it takes to cook, whether this be quick, medium or long. TIP – if you usually have a takeaway night, or try new recipes often, then you may want to add in these as possible meals on your list at this stage as well. You have now finished the ASSESS stage – and you should know what days and what meals you are planning, who you are planning to feed and how long you have to cook the meals – and your master list of meals. With all this information to hand, it’s now time to declutter! Now it’s time for the fun to begin! – the actual creating of your meal plan – so that everything is in one place for you. I wrote a post about the many ways you can pick to meal plan – which is worth a read here for inspiration and ideas, and now is the time to work out how you want to meal plan. For example – I choose a 4 week plan of all 3 meals as this gives me flexibility to choose a variety of breakfasts and evening meals, and as I work from home most of the time it’s also helpful to be able to plan what I eat at lunch time as well. Having 4 weeks means that there is more variation and I can spread out meals over the 4 weeks so we at least eat things once a month etc…. You will want to create a meal planner of some kind to write down your choices, in line with how you chose to plan in step #6 above. There are many ways to do this, so pick one that works for you (a large noticeboard in the kitchen, a blackboard, a piece of paper etc…) – and be as creative as you like – this is the fun bit! 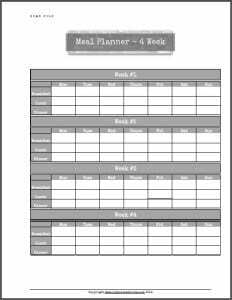 I like to use the printable grid that I have created in my Home File – see the picture below for the meal planner I have in the home file which is based on 3 meals a day over 4 weeks (I have one for just 1 meal a day over 4 weeks as well). Having the meal plan on one sheet like this means that I can add to the back of my kitchen cupboard door next to my shopping list, so that it’s accessible but out of the way, and I can also add to the shopping list whatever I need for the upcoming week. TIP – If you like the idea of working on a 4 week schedule, then why not create a plan for the different seasons? That way you can use each plan a few times each year, you can have changes that are suitable for the weather at the time, and it’s all done up front! 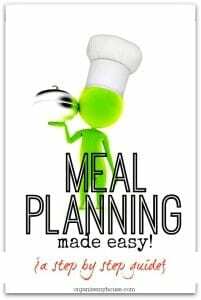 With all the information you have to hand from the previous steps, it should be relatively straight forward to add your meals to your meal planner now. If you have a school dinner menu, can you ensure that you are doing different evening meals each day to what the children have eaten at school? What about adding in a free day so you can go off-menu and try some new recipes – just so you keep things fresh! Add in a takeout night or a freezer night for days when you know you won’t want to cook or have the time. If you like to try new recipes, then add in the words NEW to the plan on days when you have time to be more adventurous, then you can decide on what to cook nearer the time. TIP – I like to use post it notes for each meal, and then I can move them around as I plan – as it can take a few iterations to get it working really well for you. Use different colours if that helps! Above all – make life as easy as you can at this stage – as the planning only needs to be done once and then you’ll have it for as long as you want it! Now is the time to get your plan going, and use it for a few weeks to see how it goes. If you are using a 1 week plan then use it for at least 4 weeks in a row, and if you are using a 4 week schedule then 1 iteration will be enough to show you whether it works well or not. TIP – Why not get ahead and cook double of some foods when you cook so that even on a day when you have a bit of time, you save time not having to cook from scratch and you can use the time for something else instead – always a bonus! But won’t a meal plan get boring? If you write down what you have eaten over the past couple of weeks, you may be surprised at how little variety you are actually currently eating now. We are all creatures of habit really, and oftentimes just reach for the same things from the cupboard each day, or the same things from the shelves at the supermarket. Planning meals ahead makes you look at your meals a little differently, and actually usually helps them to be more varied and interesting in the long run. We’re there – at the last stage of meal planning, and hopefully you’ve found that it has really helped save you time, money and stress over the past few weeks. Now is the time to take a step back and evaluate your plan. Add in some new meals and take out others that the family are tired of – and always change when things get boring – meal plans shouldn’t be dull! Previous Post: « How to make a chalkboard wall – & why every home should have one!